It was thanks to a chat with a teacher in High School that Marci Dearing decided to become a pharmacist. “It was put in my head quick early and that’s where it stayed,” she says. After graduating in 2008, opportunities in community pharmacy led her to Ontario. There she quickly benefited from new opportunities and became a pharmacy manager after just a year of practice. Marci quickly found that she thrived as opportunities to learn new things came her way. Then in 2012, she decided to take on more formalized training by enrolling in a Doctor of Pharmacy (PharmD) program in Florida. This meant a lot of travel and work on top of her full-time day job. Marci rose to the challenge. “I always knew I was going to do more schooling when I graduated but I didn’t know what that would look like,” she says. 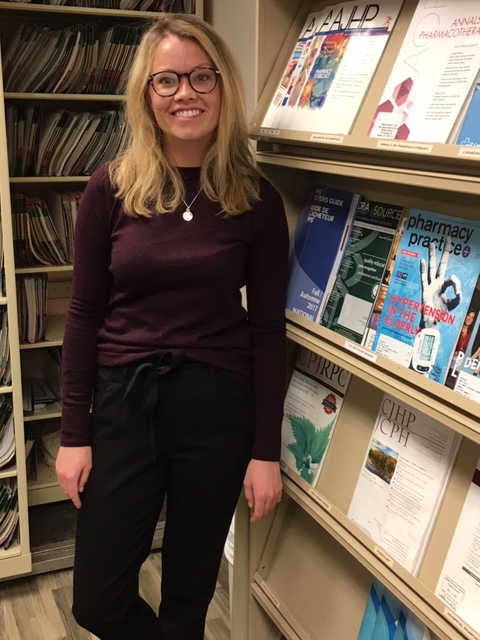 While in the last year of her PharmD program, Marci jumped on an opportunity to return home to Nova Scotia to become a manager of a pharmacy closer to her family. Upon graduation, Marci still had a thirst for more knowledge. This is what lead to her to apply for a residency in Halifax. A resident is a student, in Marci’s case she is a student at Dalhousie University, who works in the hospital (yes, she pays tuition). They complete rotations in multiple areas within the hospital and must complete a residency project (Marci’s is on the use of a particular antibiotic in conjunction with another medication for patients with bone and joint injections). Marci’s residency lasts a year and she isn’t sure what the future will bring. “I want to practice and provide patients with improved quality care,” she says. There are a lot of opportunities for pharmacists to help their patients, particular those patients who have chronic diseases. Although she took a more formalized approach to her continuing education, she points out that pharmacists have numerous opportunities to continuingly learn and help their patients.